In this article, we will discuss the options available on the Company settings page. These settings are either default values that can be changed on other pages, e.g. Should Team Leaders be the 1st level approver for members of their team or organisation wide settings like enabling Outlook Integration. We will now examine each option and it's associated settings in detail to allow you to configure Company settings correctly. This section allows you to enter the basic details about your company. This field allows you to enter a unique Company name for your organisation. It is displayed in various places on the system and it can be different from the billing details. This setting allows you to select a location from a drop down list of previously defined locations. This is the primary location for your organisation. It is useful for organisations with multiple sites at different locations and defines where the head office is located. It is not a required field. You do not have to select a location but it is recommended that you do. Also, if no locations have been defined on the system, then a 'Global' location will have been created automatically. But, only a specific location rather than the 'Global' location can be selected here. This setting allows you to select between two available options, either 'their administrator account' or 'a separate employee account'. Normally, administrators use their own accounts to record leave. But, some companies prefer to have a shared administrator account and the administrators that share this account record their leave separately on their own employee accounts. When 'a separate employee account' is selected, the administrator can log in to the system but the account is not visible as a user on the system. This setting allows you to select the primary time zone under which your company operates from a drop down list. The selected time zone can affect the 'Who’s on leave?' list, calendars and allowances for accrued leave types but only by the time difference between your actual time zone and the time zone selected here. This field should contain the email address of the first registered administrator, the person who registered the company account, and is the main contact email for the organisation. Under some circumstances we will seek authorisation from this user for account and setup changes. 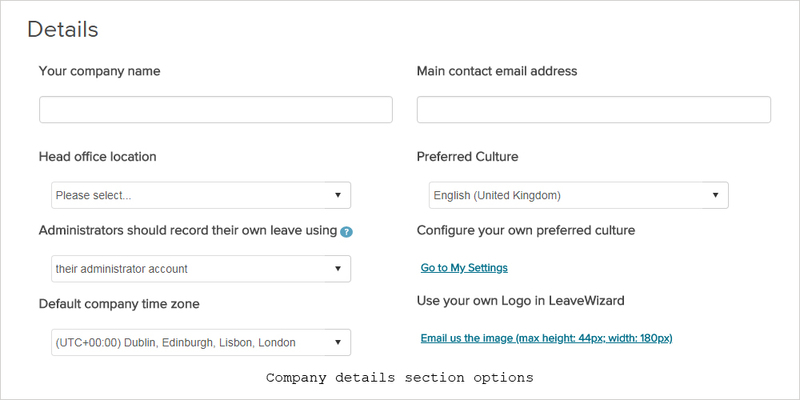 This setting allows you to select the preferred culture for the company from a drop-down list. This information is used when displaying local formats such as dates and currencies on LeaveWizard. But, these formats can also be affected by your browser’s culture setting. If you click on the 'Go to My Settings' link you will be taken to your own 'My Settings' page where you can configure your own personal preferred culture settings. You can click on the 'Email us the image (max height: 44px; width: 180px)' link to send us an email with your logo artwork and we will personalise your LeaveWizard account. Your logo will then appear on the left hand side of your main menu header. Most popular file formats including those that support transparency, such as PNG (Portable Network Graphics), are supported. The artwork should not exceed 44 by 180 pixels. We have found that logos with a transparent backgrounds are visually the most effective. This section allows you to configure the dates of your leave year as well as how it is displayed and setup the basic Holiday leave type. This field allows you to enter the day and month of the start of your company leave year. You can also click the calendar icon to open a calendar popup to enter the date. This option sets the default company leave year. The day and month from which each new leave year starts and the user's allowances are reset. LeaveWizard also allows you to set up different leave years for each employee to cater for any exceptions if your company uses different leave years for example because of location. This setting allows you to select if you record holiday leave in days, hours or both from a drop down box. The system will automatically create the appropriate Holiday leave type depending on the setting. If you choose both it will create two holiday leave types, one for days and one for hours. Main holiday allowance inclusive of public holidays? This setting allows you to select if the holiday allowance is inclusive of Public holidays or not. You can select yes or no from the drop down menu. Normally, Public Holidays are not included in the allowance and therefore not deducted from the user's allowance. But, some companies prefer to include Public holidays in the holiday allowance and then the public holidays will be deducted from the user's allowance. Changing this setting to 'Yes' will change 'Include in the allowance of' to 'Holiday' for the Public Holiday leave type and to 'None' if set to 'No'. Depending on when your leave year starts or just for personal preference, you can select if leave years are show as a single year, i.e. 2015 or as a range of years, i.e 2014 - 2015 on the system. If your leave year starts on 1st January and therefore matches the calendar year then a single year is the best option. If however, your leave year starts mid year then it will span two calendar years and is probably best represented by a range. This setting allows you to select either 'Single' or 'Range' from a drop down menu. 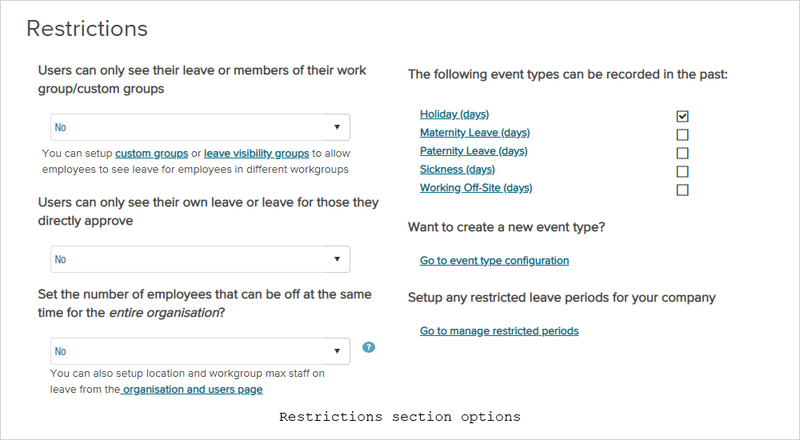 For your convenience you can click the 'Go to manage leave types' link here which will take you to the 'Event Types and Allowances' page. This section allows you to configure company wide restrictions that are imposed on users. This setting allows you to control the visibility of user's leave between users. Normally, it is set to 'Yes' in which case a user will be restricted to only seeing the leave of members of their own workgroup. If your company wants all users to see other user's leave then 'No' can be selected to allow this. You can also setup custom groups or leave visibility groups to allow users to see leave for users in different workgroups when you have the restriction in place. This setting allows you to control the visibility of user's leave between users still further. Some companies prefer to restrict visibility of leave as much as possible. If this option is selected then a user is restricted from seeing anyone's leave except their own and those for whom they approve leave. Set the number of employees that can be off at the same time for the entire organisation? This setting allows you to set the maximum number of staff on leave for the entire organisation. If you select 'Yes' then another field 'How many?' will be displayed. This setting can be useful for small organisations. Larger companies may consider using the same type of restriction but per workgroup which can be set on the Organisation and Employees page. Although, the recommended way to restrict the number of people who can be on leave at the same time is to use Restricted periods which allows greater flexibility and transparency. This allows you to select the event types from a list of all possible event types available to your company. Ticking the box next to the listed event type will allow retrospective requests to be made for that particular event type which would otherwise be prohibited. Want to create a new event type? For your convenience you can click the 'Go to event type configuration' link here which will take you to the 'Event Types and Allowances' page. For your convenience you can click the 'Go to manage restricted periods' link here which will take you to the 'Event Restriction Periods' page. This section allows you to configure company wide approval settings. Should Team Leaders be the 1st level approver for members of their team? This setting lets you set if the team leader should be the 1st level approver for members of their team for all leave types. On the approver setup page there is a 'Team Leaders are first level approvers' tick box which can be selected for each leave type. This will override the individual settings for all leave types. Should requests by admins require approval? This setting lets you choose when a request is made by an administrator on behalf of a user, if the request should be automatically approved or if it still requires approval by the designated approver. This allows you to select the event types from a list of all possible event types available to your company. Ticking the box next to the listed event type will mean that an administrator will be sent an approval request if an approver is on leave for that particular event type. This section allows you to enable and configure company wide settings for overtime and TOIL (Time Off In Lieu). Do you want to record overtime or TOIL for your employees? This setting lets you enable or disable overtime and TOIL functionality for the company. Once it is enabled, overtime requests can be made and optionally they can be converted to TOIL requests. In order to allow TOIL requests rather than overtime requests, the 'Enable Time Off in Lieu' setting must be ticked in the event type being requested. See Event types in depth for more information. Also see 'The following event types are enabled for TOIL:' setting below which displays the current settings for all event types and can also be used to set 'Enable Time Off in Lieu' for each event type. Who should receive overtime requests for approval? This setting lets you choose if overtime requests should be sent to Administrators or Team Leaders And Approvers for approval. If Team Leaders And Approvers is selected and no approver is configured then the requests will go to administrators. Do you want to record the pay rate associated with the overtime? This setting lets you choose if you want to be able to set a pay rate when the overtime request is made. If you select yes to record the pay rate then a 'Pay Rate' drop down box (Single time, Time and a half, etc.) will be displayed when overtime requests are made. Can employees record overtime in days? This setting lets you enable or disable overtime requests in days. When making an overtime request the duration setting will be displayed as days. If both hours and days are enabled then a drop down box 'Record in' to choose either days or hours will also be displayed. Can employees record overtime in hours? 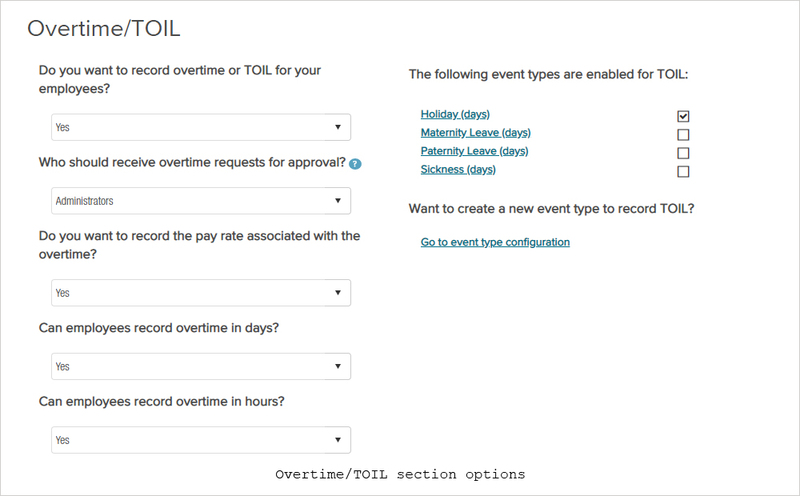 This setting lets you enable or disable overtime requests in hours. When making an overtime request the duration setting will be displayed as Hours and Minutes. If both hours and days are enabled then a drop down box 'Record in' to choose either days or hours will also be displayed. This allows you to select the event types from a list of all possible event types available to your company. Ticking the box next to the listed event type will mean that TOIL is enabled for that particular event type. Making changes here will override the settings in the 'Enable Time Off in Lieu' tick boxes in each of individual 'Leave Type Details' pages. Want to create a new event type to record TOIL? This section allows you to configure company wide notification settings. Can employees change their email notification options? This setting lets you choose if users can change their email notification options or not. When set to 'No' all users will receive emails from LeaveWizard when their requests are approved or rejected or if requests are made on their behalf, etc. If set to 'Yes', users can choose if they want to receive these notifications or not. In their My settings, preferences section they can choose and if they want these emails and if they would also like emails sent when they request leave and overtime. Do you want approval reminders to be sent to line managers? This setting lets you choose if you would like approvers to be sent approval reminders or not. When set to 'Yes', and if the approver has email notifications on, then daily reminder emails will be sent to approvers who have pending approval requests. This will help ensure that pending requests are approved in a timely manner. This allows you to select the event types from a list of all possible event types available to your company. Ticking the box next to the listed event type will mean that administrators will be notified when requests are approved, modified or cancelled for that particular event type. Do you want to send a monthly allowance report to each employee? This setting lets you choose if you would like to send a monthly allowance report to each employee. When set to 'Yes', and if the user has email notifications on, then on the 1st of each month an email will be sent to the user detailing their allowance balances. The leave types which are included in the report are selected by the 'Include in Allowance Report' setting in the 'Other Options' section of each of the leave types. See Event types in depth for more information. Send Weekly Leave Reports to Approvers and Administrators? 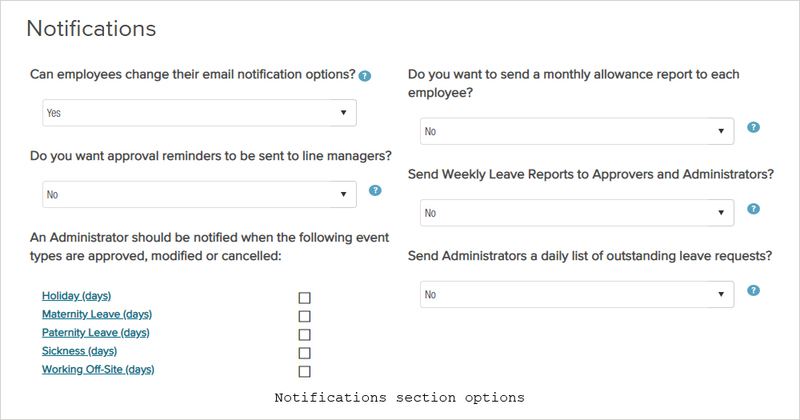 This setting lets you choose if you would like to send a weekly leave Report to Approvers and Administrators. When set to 'Yes', an email with the list of leave and absence events due to take place over the next week will be sent to both. For Approvers this will include the events of users in their team. For Administrators this will include all events in the organisation. Send Administrators a daily list of outstanding leave requests? This setting lets you choose if you would like to send a daily list of leave request that are pending approval, which have been open for longer than the specified number of days, to Administrators. When set to 'Yes', an additional field 'Include leave requests older than' will be displayed with a drop down box allowing the number of days to be specified. This section allows you to enable or disable iCal (Outlook and Google Calendar) integration for the company. Do you want to share all leave with your employees via Outlook or Google calendar? This setting lets you choose if you want to enable or disable iCal integration for the company. When set to 'Yes', it will allow users to synchronise and display all of their visible leave with an external internet calendar such as Outlook or Google calendar. For your convenience you can click the 'Go here to configure your external calendar options' link which will take you to the 'Preferences' section of the 'My Settings' page where you can subscribe and configure your own personal internet calendar. This section allows you to configure Bradford Factor calculations for your company. Does your company use the Bradford Factor? This setting lets you choose if you want to enable or disable Bradford Factor calculations for your company. When set to 'Yes', the Bradford factor will be calculated for users and displayed on the system, for example on the Organisation And Employees page and a Bradford Factor report option will become available in the reports section. This setting lets you specify a start date for the Bradford Factor calculations which rolls over every 52 weeks (know as the set period). By default, the start date is set to the date that the company was registered with LeaveWizard. This allows you to select the event types from a list of all possible event types, suitable for Bradford Factor calculation, that are available to your company. Ticking the box next to the listed event type will mean that calculations will be enabled for that particular event type. This section allows you to configure the Room Booking function for your company. This setting lets you choose if you want to enable or disable the Room Booking function for your company. When set to 'Yes', Room Booking will be enabled and a menu item will be available under the Tools section of the main menu. This setting lets you select which LeaveWizard role level, Administrator, Line Manager or Employee, that is required to use and manage the Room Booking function. Everyone with the selected level or above will be able to use the function. For example, if you select 'Line Manager' then only line managers and Administrators will be able to access the Room Booking function. For your convenience you can click the 'Go to manage rooms' link here which will take you to the 'Manage Rooms' page. Need to configure who can request/edit room bookings? For your convenience you can click the 'Go to room booking groups' link here which will take you to the 'Room Booking Groups' page. From there you can create user groups which allow the users in the list to create and manage room bookings in addition to those allowed by the role restriction 'Who can book rooms?' above. e.g. you can allow only Administrators to book rooms but additionally allow a group of other users by adding them to a group. This section has links to complete company lists and is useful when looking for items that have been deactivated and are not displayed elsewhere. Click the All Calendars link to go to the 'Calendars' page which has a list of all the calendars that exist, including deactivated ones. Click the All Employees link to go to the 'Employees' page which has a list of all the Employees that exist, including deactivated and hidden ones. Click the All Event Types link to go to the 'Event Types' page which has a list of all the Event Types that exist, including deactivated ones. Click the All Locations link to go to the 'Locations' page which has a list of all the Locations that exist, including deactivated ones. Click the All Rooms link to go to the 'Rooms' page which has a list of all the Rooms that exist. Click the All Workgroups link to go to the 'Workgroups' page which has a list of all the Workgroups that exist, including deactivated ones.